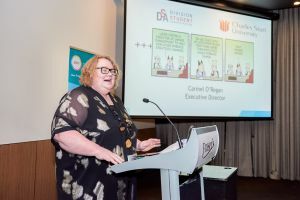 Carmel O'Regan is Executive Director of Student Administration at Charles Sturt University (CSU) and a graduate of our Master of Tertiary Education Management. She received the Excellence in Leadership Award at the 2018 ATEM/Campus Morning Mail Best Practice Awards earlier this month, an award which recognises her exceptional leadership skills in improving the student experience and streamlining of systems at CSU. Carmel agreed to answer our five questions below. I never grew up thinking I want to work at a university when I am old enough - who does?- and was passionate about journalism and Chinese history. I completed a Bachelor of Arts at the University of Newcastle straight from school and worked various part time jobs wondering how my two passions would merge. I moved from Newcastle to Sydney to get my first “real Job” and I was offered a position involving campus administration at Australian Catholic University based at North Sydney. Little did I know I had found my next passion and would be very fortunate to love what I do during my career. I have worked in the higher education sector for nearly thirty years, and have worked at five universities in New South Wales and Queensland during that time. I have held a range of positions, including senior executive roles such as my current one as Executive Director of the Division of Student Administration at Charles Sturt University, which I joined in January 2017. What has been your most important work experience? My most important work experience is tied to the people I work with. From exceptional to challenging, I have worked with people whom I've learned from. I believe that if you do not commit to developing and encouraging staff, they will not excel. You need to appreciate their strengths and encourage work on areas requiring improvements in order to develop an effective and engaged team that continually strives for best practice. What does ‘leadership’ mean to you? Leadership is being inspirational, innovative, proactive and having exceptional skills in identifying and articulating a vision, and then bringing your team along for the delivery of that vision. Leadership is being fearless in challenging the status quo and having the tenacity, courage and empathy for the bigger picture. It is also about finding client centred solutions. What advice would you give to the aspiring leaders of higher education? Be prepared to take any opportunity you are offered; it is about learning and skill development and it is OK not to know everything. Where do you recommend visitors go while in Wagga Wagga? The CSU Winery - it's fantastic and unique.